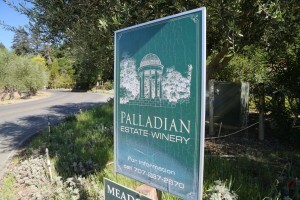 Palladian Estate Winery is a partnership between retired shipping veteran David Jones, and his wife Sandy and long time well-respected Napa winemaker David Mahaffey. David Jones was instrumental in the design of modern day cargo shipping containers; he and Sandy eventually relocated here from San Francisco with the intent to create an English countryside estate. Stone walls (built from rocks on the property as well as rocks removed from the soils while prepping their vineyard) line the property. Roses, olive trees, fruit trees and a vegetable garden are planted on site. Perhaps English countryside meets Tuscany in this beautiful slice of St. Helena. Palladian Estate merely produces one wine each year, a 100% estate grown Cabernet Sauvignon. 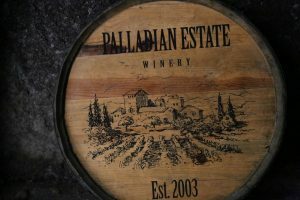 The name comes from the small very European looking Palladian temple (imported from England) built on a hillside above the vineyards. 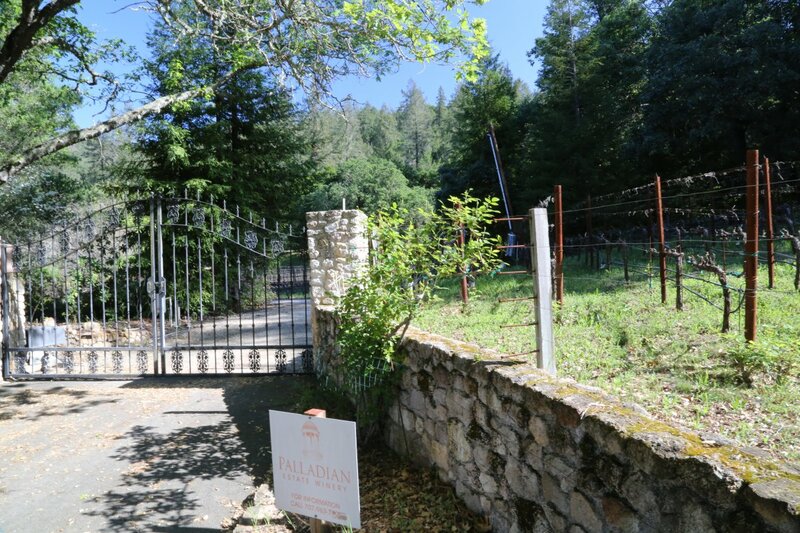 The winery and vineyard are located just down the street from the acclaimed Meadowood Resort, almost across from the prestigious Napa Valley Reserve and just down the lane from Alejandro Bulgheroni Estate (perhaps we can call this neighborhood, Billionaires Row). All varietals used in their single vintage Cabernet Sauvignon are grown on site including the Cabernet Sauvignon, Cabernet Franc and Merlot. 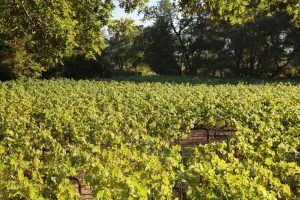 Three acres of vineyards are planted just east of the Silverado Trail – on the valley floor near where the Vaca Mountain range starts to climb out of the valley. The vines were originally planted in 1997 and before they began making their own wine, the grapes were sold to select local wineries. David is a veteran winemaker with more then 35 vintages under his belt. While not classically trained as a winemaker (his degree is from Harvard in Education) David has taken classes from UC Davis and learned wine making while making wine for other producers. He has also taught wine making classes at Napa College. His philosophy is that wine making begins in the vineyards; he describes his vineyard management of Palladian as not being farmed, rather it is gardened (organically) by hand without the use of tractors. David pays careful attention to canopy management – allowing just the right amount of sunlight in to create evening ripening. Aside from all the details that go into micro managing a vineyard of this size, the real art of a winemaker is in the blending and David excels at this. All the wine making is conducted with as little machine intervention as possible and like the work done in their vineyard, much of the wine making work is also done by hand. However, a simple forklift is essential for their gravity flow operations. Earlier in his career, David was instrumental in designing what is now an essential piece of equipment for many wineries, the wine ozone machine used for controlling contamination, treating barrels and and used for various sanitizing applications. At the time of his invention this type of machinery was unheard of in the wine industry. 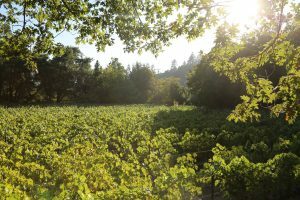 Today, it is available through one company only (Carlsen & Associates) and many of Napa’s wineries use this in their wine production. A visit here is always with David, is very personable and is for serious wine enthusiasts. 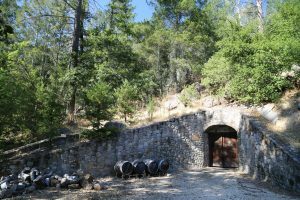 The cave on site is one of the smaller wine caves in the Napa Valley – original plans called for drilling 50% further into the hillside, but there is one rock that stops even the most determined cave drillers and that is obsidian. The drillers soon encountered a solid piece of this rock and that is where the cave ends – around 40 feet in from the entrance. Despite the small size of the cave it remains remarkably cool in here even on 100+ degree days. In addition to the cave, additional cold storage is on site – note the cargo containers next to the side of the hill framed by a rock wall. These are used for storing wine and in addition are an example of the types of cargo containers David Jones helped design. David has been the winemaker since the beginning (their inaugural vintage is from 2003). Cabernet Sauvignon is Palladian’s primary varietal and Merlot and Cabernet Franc are blended in as necessary. David’s philosophy is to create a wine that is not a typical robust Napa Cabernet dominated by fruit and high alcohol, rather a wine that certainly has California fruit characteristics, but is lower in alcohol (usually in the high 13% range) with a Bordeaux type structure (open top fermentors and a moist and humid cave in part helps the wine lose alcohol during fermentation and aging). 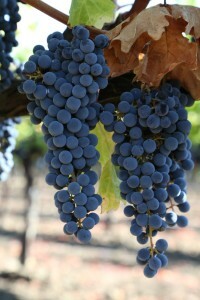 The wines are also held back much longer then most current Napa releases – often up to 6 years for the Cabernet Sauvignon (2 or three years in barrel and then at least 2 years in bottle before release). David often blends in a small percentage of a newer vintage into the older wines just before bottling. The 2007 Cabernet Sauvignon vintage shows cedar and cigar box aromas intermingled in with the fruit on the bouquet followed by a pleasing diversity of fruit flavors on the palate along with hints of vanilla. For such a young wine (at the time of our original visit) the fruit is already showing very nicely. With additional aging and blending the tannins will soften out.